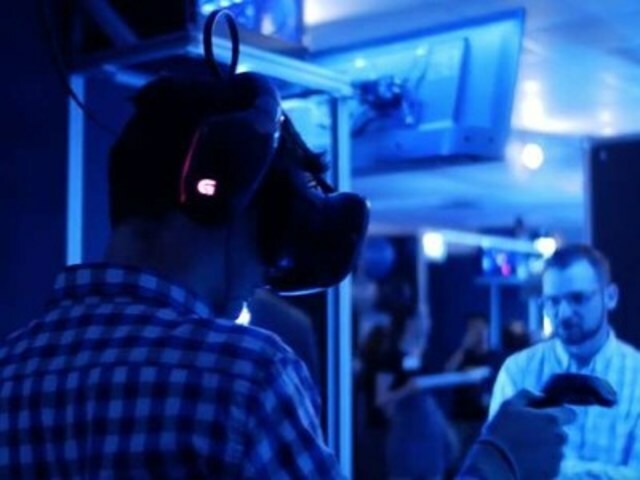 WATERLOO, ON, Oct. 21, 2016 /CNW/ – Four months after opening its doors, Canada’s very first virtual reality arcade is looking to give back to the community. Ctrl V, located in Waterloo, is hosting the first ever multi-person virtual reality gaming marathon. The 25-hour long event will be in support of Extra Life, a non-profit organization that works with the Children’s Miracle Network to raise funds for local children’s hospitals. Participants will donate $25 for 50 minutes of gameplay, with all proceeds going towards SickKids Hospital in Toronto. Space Pirate Trainer, The Brookhaven Experiment, and Job Simulator are just 3 of many titles that participants can experience on the HTC Vive. Ctrl V offers many different experiences, ranging from traditional first person shooters, swimming with a life-sized whale, or creating your own universe. Exclusively at this event, participants will be able to experience Google’s Tilt Brush for the first time, where users will have the opportunity to paint in all 3 dimensions. Google does not allow Tilt Brush for commercial use but has granted Ctrl V special permission to offer the game for the charity event. Participants can view other current game offerings at http://www.ctrlv.ca/software/. One of the many things that sets Ctrl V and their franchisees apart from other existing virtual reality arcades is its custom user interface. Designed in-house and named the ‘Ctrl Room,’ the user interface includes content delivery, station management and back-end data tracking. At the charity event, Ctrl V will be revealing an exciting new update to the user interface. Teleporting users into a virtual reality rendering of the flagship Ctrl V location, they will be able to interact with other participants before selecting a game. The event is being held from 8:00 AM, Saturday, November 5th to 8:00 AM Sunday, November 6th at the Waterloo location, located at 170 Columbia St W, Suite #5. Up to 16 players can experience the various virtual reality offerings at the same time. There will be many prizes, giveaways and challenges happening at the event. This includes a free custom designed event t-shirt that will be given away to visitors who participate by purchasing a virtual reality session during the event. Ctrl V hopes to raise at least $10,000 to donate to SickKids Toronto and to set an unofficial world record for the most combined consecutive hours spent in VR in one room. More information about the event can be found on Ctrl V’s website at http://www.ctrlv.ca/extra-life/.